Get there early if you're not pre-registered! 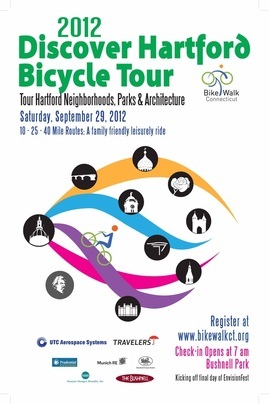 The 2012 Discover Hartford Bicycle Tour will take place on September 29, kicking off Hartford's EnvisionFest and iQuilt celebration. Choose from 10-, 25-, or 40-mile routes. Please note that routes are subject to change. The Tour is rain or shine. Dress for the weather! 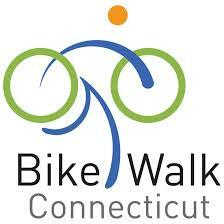 Same day registrants: Please bring a credit card; check already made out to Bike Walk CT for $45; or correct change if paying cash ($45). While riding, remember to follow the Rules of the Road and obey traffic rules. Set a good example for all of us! Your helmet. Helmets are required for all riders. A reusable water bottle (water and cups provided at rest stops but not in bottles). Cash if desired for vendors at EnvisionFest and Pipes in The Valley. 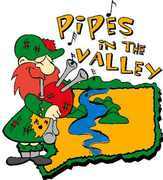 Then stay for the day for EnvisionFest and Pipes in the Valley!